Provides the necessary vitamins your body needs for healthy skin, nails and hair. A person’s hair is a significant part of their overall identity. It’s one of the things that makes us unique and plays a large role in our self image and confidence. For centuries, hair loss was perceived to be a men’s issue. But, according to the American Hair Loss Association, women make up about 40% of American hair loss sufferers, and it can be an extremely distressing experience for both sexes. Chemicals and pharmaceutical products can be an expensive and dangerous proposition, but New Look uses all-natural, pharmaceutical grade vitamins, minerals, herbs and bionutrients to keep your hair, skin and nails looking youthful, rich and lustrous. New Look’s cutting edge formula addresses one of the root problems associated with hair loss. For many people, thinning and receding hair is due to a nutrient deficiency, so New Look utilizes several proven essential vitamins and minerals promote hair and nail growth such as L-cysteine, biotin, millet, oatstraw and horsetail extract. 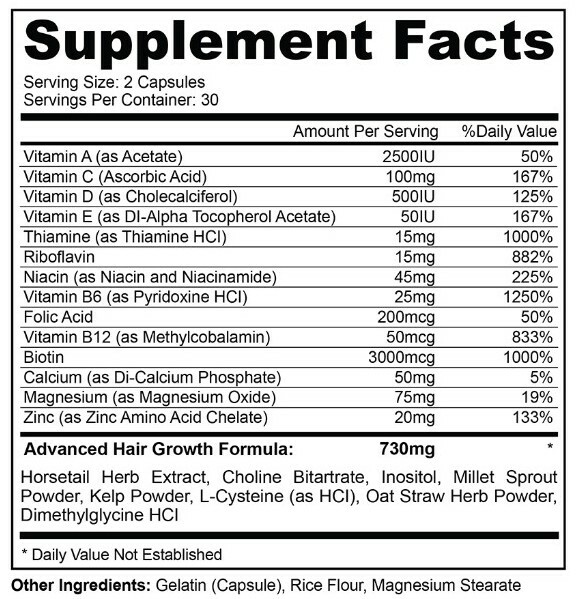 This compound not only addresses hair loss, but can also leave existing hair looking fuller and healthier with volume. Take 2 capsules daily with a meal and a full glass of water. Recommended: 1 capsule with breakfast and 1 capsule with dinner. Results are typically seen after 1-3 months. Maximum results are seen after 6 months of use. If faster results are desired, you may increased dosage to 2 capsules twice per day. Keep out of reach of children. If you are pregnant, nursing, taking prescription medication, or have a medical condition, consult your physician before use.